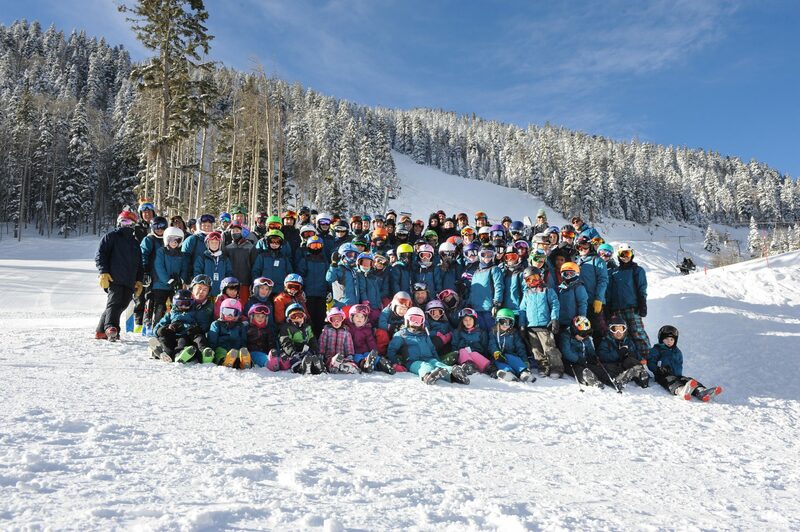 On Feb 7th and 8th the Taos Winter Sports Team (TWST) hosted slalom races as a part of the second stop of the Rocky Mountain Division Southern Series. TWST athletes enjoyed a successful weekend of racing under sunny skies with racers on the podium in nearly every age category. Teva Leshem split the weekend with 2 gold medals and 2 silver medals in the U14 category. According to coach Ian Hanbury “this was a gutsy performance out of Leshem. He was racing with a low grade fever all weekend and yet he was able to put good runs down the hill, with his last run of the weekend being his best.” Luke Trevisani ended up with a 4th and three 5th place finishes in this category. TWST racers dominated the girls U14 category with Casey Chandler sweeping the weekend with 4 golds, Anna Swanson snagging 3 silvers and Pippin Katalevsky bringing home 2 bronze medals and a 4th. Hanbury notes that “these girls are skiing fast and they are working together to make good things happen for each other on the hill.” Kyra Bowden worked hard to emulate the results of the older girls by grabbing a gold and 2 silvers in the U12 event with Sasha Walinsky skiing to two 6th place finishes. For the girls U10’s Greta Swanson enjoyed two 5th’s, a 6th, and a 7th. The U16 girls event saw Blake Trevisani with the win on Sunday and Taylor Portman with silver and a bronze on the weekend. TWST racers also saw commanding efforts from the U8 girls with Greta Klinkman sweeping the weekend with 4 golds in her first ever race and Rowan Heflin taking 3 bronze medals. In the boys U12 event Aidan Heflin continued his season of strong results with a silver two bronze and a 5th place result. Heflin was followed closely by Ian Olson with a 5th a 6th and two 7th’s, while Spencer Kirby grabbed a 7th, a 9th, and a 10th. The boys U8 races saw Isaac Olson with two 4th place results and a 5th. In the U10 races Pierce Trevisani finished with a 4th, two 5th’s, and a 6th.